We might disagree, especially when we consider the ultra-massive hill climb venue known as The Big Nasty. 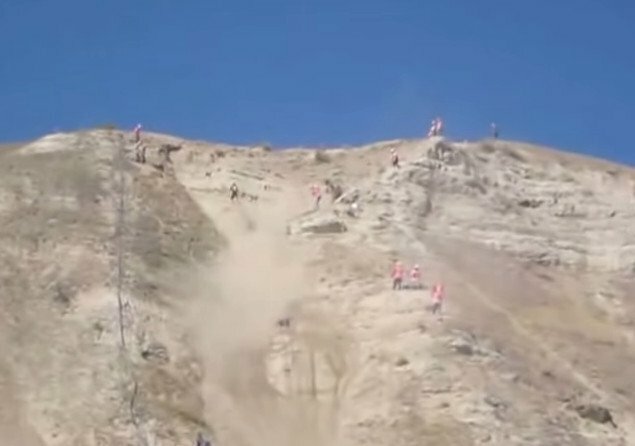 Located in New Plymouth, Idaho, The Big Nasty is a near 3,000-foot course where maniac riders compete for the glory of making it to the top in the least amount of time and with the least amount of trouble. Of course, “trouble” is this arena translates to entertainment. The venue is sort of insane. The massive hill is ringed with campsites, a dance floor, and secondary off-roading events, like the four wheeler mud bog at a place called Tom’s Ditch. There’s also a curiosity called the snowmobile grass drags. “Snowmobile grass drags have been part of Idaho’s largest motorcycle event, the Big Nasty Hill climb. Forty-four sleds showed in 2013, the first year the event took place. With 12,000 visitors to the annual event, it’s been called the place where NASCAR meets Burning Man. “Big Nasty Land,” declares the website. “For three days of hill climbing, mud drags, camping, food, fireworks, live music, and now….100mph snowmobile grass drags! This is a mecca for all things motorsports. But the star attraction is the motorcycle hill climb race. The bikes are actually custom built, and contenders such as Jason Smith, Lonnie Sparks, and Eric Schaffer have become celebrities in these circles. This is truly a motorsports event worth witnessing. Come out and stay a while, mix it up with the regulars and witness the grandeur that is the Big Nasty Hill Climb. This year’s event takes place September 18 through 20.